Mercedes SLK goes diesel | What Car? 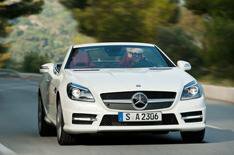 Mercedes-Benz has launched the first-ever diesel version of its SLK roadster. The SLK 250 CDI has the 2.1-litre, 201bhp four-cylinder diesel engine from the C- Class, E-Class and CLS models. In the SLK, it averages 57.7mpg; thats a 14.9mpg improvement over the next most efficient petrol SLK model, the 250 CGI. The SLK 250 CDI emits 128g/km of CO2, a 30g/km improvement over the 250 CGI. Company car tax is 18% for the diesel version, whereas the petrol falls into the 20% bracket. A seven-speed automatic gearbox and engine stop-start system come as standard. Mercedes claims that performance is equivalent to a petrol engine that's twice as big, thanks to 369lb/ft of torque. It quotes a 0-62mph time of 6.7 seconds; 0.1 seconds slower than the 250 CGI petrol. Top speed is 151mph. Externally, the 250 CDI looks like any other SLK model. The same range of options are available, including a 'magic sky control' roof, which changes from dark to transparent at the touch of a button. Mercedes hasnt confirmed the UK on-sale date or prices. The European model hits showrooms on September 13, from 41,829, which means UK cars should cost around 37,000. The SLK 250 CDI will be part of Mercedes' display at the Frankfurt motor show next month, alongside the new B-Class and the SLS Roadster.